This is a specially requested stitching pattern of Lilo’s friend. Stitch, or Experiment 626, is a genetically-manufactured extraterrestrial that became best friends with little girl Lilo under the guise of her pet. This cross stitch chart would be great for your children’s cross stitch project or as a gift for those who are fond of this wonderful animation character. Disclaimer: “Disney” and “Lilo & Stitch” names and images are the copyright, trademark and property of Disney. All rights reserved. 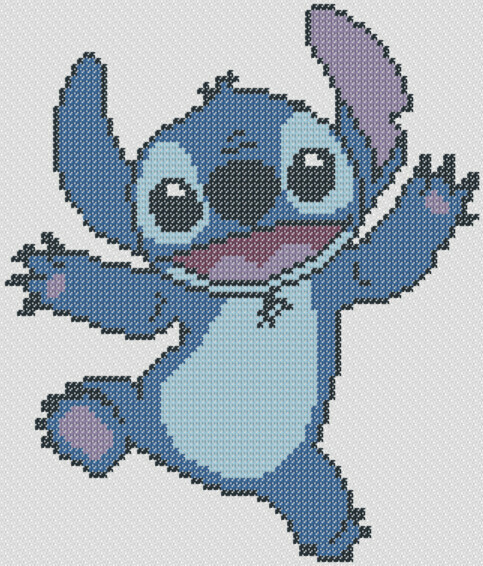 Cross stitch patterns found in this site bearing the Disney and Lilo & Stitch’s names and images are for personal use only. Download this Disney’s Lilo & Stitch cross stitch zipped file (approx. 469kb — downloaded 513 times). Please DISABLE your pop-up blocker to access this. Every downloadable cross stitch patterns that are included in CrossStitch4Free.com provided to you to use for free. Each file is password-protected to ensure that these files are not claimed by anyone else as theirs, or the patterns resold for profit. If you would like to refer your friends to download our cross stitch charts, please provide them the link to this site instead of distributing the file. The Terms of Usage for using the cross stitch patterns can be obtained by going to the main page (Home) of this site. You can register for free updates by subscribing to our e-mail updates or by adding our website RSS to your feed reader.